Enforce the cyber-laws of a weird retro internet. What is it? A nostalgic internet detective adventure. Once upon a time, the internet was something you went on rather than something that was always there. It was a thing you'd occasionally enjoy, usually in the evenings when it was cheaper; not a fibre optic thread running through every facet of your existence. And Hypnospace Outlaw, a cyber-detective adventure set within a fictional computer operating system, is a nostalgic return to this Old Internet. 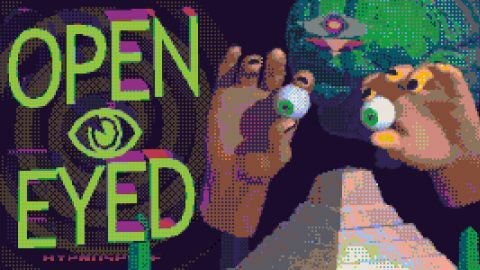 In the game's alternate 1999, people climb into bed at night, snap on a high-tech headband, and drift into Hypnospace. This garish low-res internet, inspired by the digital shanty towns of GeoCities, is fully realised. There are hundreds of pages to click around, split into zones that reflect the personalities of their eccentric creators. In Teentopia you'll find edgy teenagers, nu metal, and drama. In Open Eyed, new age spiritualists and conspiracy theorists. It's a brilliantly observed snapshot of the primordial web. You are an Enforcer hired by the creator of Hypnospace, Merchantsoft, to locate and destroy objectionable content. This could be copyright infringement, harassment, or malicious software. And when you find something that breaks the rules you click on the gavel at the top of your browser, then on the offending article, and watch as it's scrubbed from the internet. In return you receive a bounty of HypnoCoins: a currency used to buy software, wallpapers, virtual pets, screensavers, and other frippery to personalise your OS. But it becomes clear after a few cases that you are not a force for good, and have been weaponised by Merchantsoft to ruthlessly censor and control the web. An early case sees you removing cute kids' drawings from a teacher's website because they contain a copyrighted image of a cartoon character. Bringing the gavel down on these harmless doodles was genuinely difficult, and the sound of HypnoCoins tinkling into my virtual wallet, my thirty pieces of silver, only made me feel worse about what I was doing. Later cases are much more involved, and Hypnospace Outlaw reveals itself to be a surprisingly challenging puzzle game. Tasks include busting an illegal file-sharing ring and infiltrating a hacker collective, and doing so requires some genuine detective work. You use a search engine to trawl the web for unlisted pages, secret communities, passwords, and other clues, and I had to have a notebook on hand to keep track of important names and keywords. When I cracked a case with imagination and perseverance (rather than just stumbling into the solution, which happened occasionally) it felt massively rewarding because I knew I'd done all the legwork myself. Even so, the guilt of working for The Man, a corporate censorship drone, is hard to shake. There are opportunities for redemption, however. I won't go into specifics, but Hypnospace Outlaw does have a narrative threaded through it, with some brilliant twists and turns. And these often change the flow of the game, taking you in unexpected directions. But no matter what you're doing, the heart of the thing remains Hypnospace itself: a superb, frequently hilarious pastiche of the early days of the internet, complete with animated GIFs, garish typography, under construction signs, tiled backgrounds, and looping MIDIs. But Hypnospace Outlaw does more than just parody the GeoCities aesthetic to score easy nostalgia points. It perfectly captures the feel of the Old Internet too. That surge of creativity unleashed by normal people being able to make their mark on the web for the first time. The tribalism, in-jokes, and intercommunity rivalries. The militant moderators, bullies, and oddballs. As you click between these vivid, animated pages you get the sense that this is a real, thriving community that existed long before you turned up. The world-building is remarkable considering it all takes place in a web browser. The HypnOS interface holds everything together, being an almost fully functional operating system in its own right. You can drag icons around the desktop, download and open documents, listen to audio files in a WinAmp-style media player (complete with lurid skins), and even choose from a selection of screensavers. It's also possible, if you're careless with what you download, to contract viruses. One makes your windows slosh and lurch around like a boat in the water, but you can, thankfully, install anti-virus software. It all feels nicely clicky and tactile, although it can get a little confusing when you have a lot of windows open simultaneously. I also found the slow loading times, as authentic as they are, a little frustrating when trying to navigate quickly between pages. You can waggle the mouse cursor to make the page furniture pop in more quickly, which is a cute idea, but the novelty wore off pretty quickly. Those criticisms aside, Hypnospace Outlaw is, rather unexpectedly, one of the best detective games on PC. Its puzzles are layered and complex, but never unfair. It respects you enough to let you figure things out at your own pace, and with almost no hand-holding. But if you do hit a wall (trust me, you will) there's a well-designed hint system buried in there too. Its internet is a joyous explosion of art, music, creativity, and weirdness, and a pleasure to explore. And it's a nice reminder of when the internet felt like a cool underground club, rather than a pervasive Hell from which there is no escape. Disclosure: PCG contributor Xalavier Nelson Jr. worked on Hypnospace Outlaw.